The study and control of the possible affections to structures and people as a result of its exposure to vibrations, induced generally by the anthropic activity (rail traffic, blasts, excavations, etc.) give the necessity of monitoring and control these vibrations and their generating sources. The monitoring of vibrations is executed by registring the speeds pics or accelerations, and the associated frequency of vibration in a structural element, as a result of its exhibition to a vibration or wave train induced by the anthropic activity. 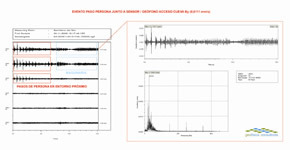 For it highly sensitive accelerometers or geophones (able to register ranks of vibration frequencies included between 1 and 300 Hertz) and specific seismographs are used. The control of the vibrations that affect structures, buildings, and people, normally is regulated by different norms that establish thresholds or maximum vibration limits, according to national and international norms, such as ISO 2631-2, ISO 4866, UNITE 22381 or DIN 4150.